Here you can configure the AquaStretch function of AquaSnap. To access this screen, double-click on the tray icon, at the bottom-right corner of the screen, and click on AquaStretch. AquaStretch allows you to easily fill the free space on the screen by double-clicking the edges or corners of a window. By doing so, the window will extend in the corresponding direction and try to fill the available space. Stretching mode: here you can choose between several window stretching modes. The default value is AquaStretch. Disabled: when selected, window stretching is disabled. Double-clicking on the window borders will have no effect. AeroStretch: when selected, double-clicking on the edges or corners of the window will extend the window in the corresponding direction and in the opposite direction. 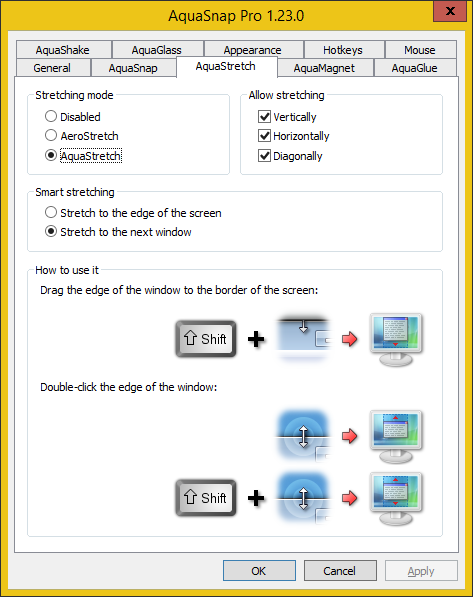 AquaStretch: when selected, double-clicking on the edges or corners of the window will extend the window in the corresponding direction. If you do the same while holding the Shift key, the window will extends in the clicked direction and in the opposite direction. Allow stretching: here you can choose in which directions you want to allow the windows to be stretched. Vertically: if checked, the windows can be stretched vertically by double-clicking on their left and right borders. The default value is enabled. Horizontally: if checked, the windows can be stretched horizontally by double-clicking on their upper and lower borders. The default value is enabled. Diagonally: if checked, the windows can be stretched diagonally by double-clicking on their corners. The default value is enabled. Smart stretching: this setting allows you to choose if the other windows must be taken into account when stretching a window. The default value is Stretch to the next window. Stretch to the edge of the screen: if selected, the window will extend to the edges of the screen. The other windows will be ignored. How to use it: here is an explanatory picture summarizing how AquaStretch is currently configured.